This color composite of the unusual polar ring galaxy NGC 4650A was created from data from the MUSE instrument on ESO's Very Large Telescope in Chile. 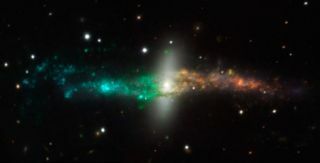 The MUSE instrument, which went online in March 2014, splits the light from each part of the galaxy into component colors to show the chemical and physical properties of each point. A new telescope tool for peering into the cosmos and creating three-dimensional views of the universe has passed its first major test at a European observatory in Chile's high desert. After a decade of design and development, the tool — called the Multi Unit Spectroscopic Explorer (MUSE) — successfully captured its first images of deep space to create 3D views of the early universe. Installed on the European Southern Observatory's Very Large Telescope (VLT) in Chile, MUSE can both study and image the depths of space. This mosaic view of the Orion nebula was created using the European Southern Obsevatory's Very Large Telescope and its MUSE spectrograph, which splits the light into its component to reveal the chemical and physical properties of each point. Image released on March 2014. MUSE uses 24 spectrographs to split light into its component colors (spectra) to assemble images and spectra of different regions of the sky. Studies of these colors can provide insight to astronomers about the composition and movements of various objects. MUSE also creates a 3D image of objects with the light waves it obtains. Known as integral field spectroscopy, the technique allows astronomers to study the properties of different regions of an object at the same time. Applying the technique to galaxies, for instance, can reveal not only their chemical composition but also details about their rotation. The European Southern Observatory's MUSE spectrograph on the Very Large Telescope in Chile allows for three-dimensional images of the objects it studies. Various views of the Orion Nebula, shown above, allow astronomers to move through different views at various wavelengths. Once the images have been split into a variety of wavelengths, astronomers can move through different views of the object, like a channel surfer tuning into different television channels. Following its installation on Unit Telescope 4 of the Very Large Telescope, MUSE captured test images of distant galaxies, bright stars and other objects in early 2014. The data was released earlier this month at the 3D2014 workshop in Germany. In addition to its own technology, MUSE also takes advantage of the advanced adaptive optics on its base telescope. A technology that helps to remove atmospheric distortions from images the telescope—and thus MUSE—observes, adaptive optics allows for a significant improvement in image sharpness. The ESO is in the process of converting Unit Telescope 4 into a fully adaptive instrument. With successful test images under its belt, MUSE will continue to probe the ages of the universe. Galaxy formation, chemical properties, and motion are prime science goals of the instruments. MUSE will also be able to study the planets and stars in the solar system, as well star-forming regions in the Milky Way and distant galaxies. MUSE is the result of ten years of work by the MUSE consortium, which is headed by the CRAL. Partners include the Leibniz Institute for Astrophysics Potsdam and the Institute for Astrophysics in Göttingen in Germany, Switzerland's Institute for Astronomy EETH, the Research Institute in Astrophysics and Planetology in France, the Netherlands Research School for Astronomy, and the ESO. "A muse is there to inspire. Indeed, MUSE has inspired us for many years and will continue to do so," Bacon said in the MUSE team's blog. "No doubt many astronomers from all over the world will also be charmed by our MUSE."